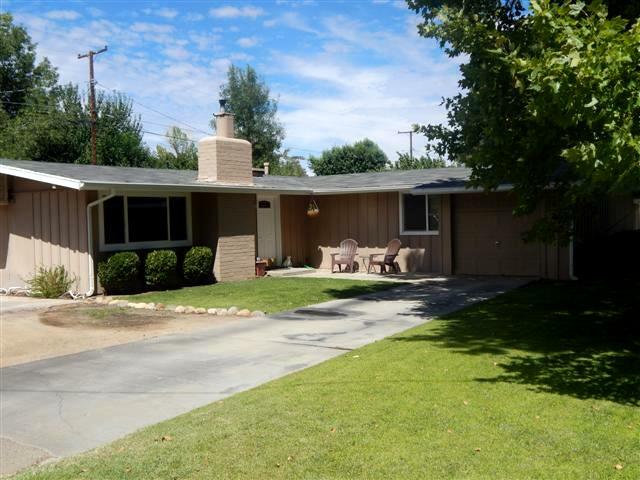 291 Meadow Lane is located in the desirable Manor Market area in Bishop California. This friendly neighborhood is just outside the city limits, and you will often see your neighbors out walking with their families and pets. This is a charming 3 bedroom 1.75 bath home is on a corner lot. This home has a great open floor plan! The kitchen and bathrooms have been updated and have new tiled flooring. Great pellet stove in the living room that gives you a cozy feel on cold winter nights. Ceiling fans and evaporative cooler will keep you cool during the hot summer months. The new dual pane windows help make the home more energy efficient. This home has amazing views of the Sierra Nevada Mountain Range from a large fully fenced back yard. The back yard has a gorgeous redwood deck, a recirculating pond and garden areas. These low maintenance yards have automatic sprinklers in both the front and back areas. Beautiful mature trees located in the front of the home. The home has a one car attached garage and the property offers lots of off street parking. 291 Meadow Lane is located off of Line on the west end of town. This part of town is unique with some of the properties having ponds and streams that create a nice relaxing feel. There are lots of shady trees in the area which are nice to have during those summer months to add some shade to the area. You are just far enough to get away from the busy streets but close enough that it does not take long to get to the grocery store. There is a local market in this part of town for those quick items needed. You can take the kids to the nearby parks. And forget the beautiful views of the Eastern Sierra Mountain Ranges!